nut allergies | Can Men Cook? Hi Ruth – most of us know someone who has allergies – hay fever, some asthmas and the like. We also know of extreme reactions – like to bee stings and nut allergies, which are not just ‘reactions’ – they can be fatal. I assume there are lots in between? There are four main categories. 1) Anaphylaxis which is the really scary swelling of the throat which can be fatal. 2) Allergies can also affect breathing, cause asthma, chronic eczema and stomach problems and can develop from a mild reaction to more severe and anaphylactic reactions over time and exposure. 3) Food Intolerances are also very common, in this case someone might tolerate milk in small doses or be able to eat butter and hard cheese but not milk. They don’t get an allergic reaction but can feel very unwell if they eat too much of their problem food. 4) Finally there is coeliac disease which is an auto-immune condition where gluten damages the villi in the small intestine. It’s hard to diagnose and left untreated can lead to fatalities. These days though we understand the condition better – avoidance of gluten forever is the only treatment. I have a friend (shock!) who was my best man – and he has an allergy to dairy. I guess this one varies in intensity of reaction too? He used to have a very small amount of cheese weekly to try to keep that enzyme working? I guess some people can and some can’t? Allergies can range in severity. It sounds like your friend has a dairy intolerance if he is able to tolerate a small amount of cheese and in this case he is doing exactly the right thing. It can be a bad idea to completely cut out foods if you don’t need to. I used to be able to tolerate butter and yogurt but slowly my reactions got worse, my lips and mouth would swell and itch and my skin would become very itchy too. I cut out dairy altogether to stop my eczema, which worked, but now even a tiny trace of milk or dairy causes chronic, severe swelling around my eyes, cheeks, face, neck and scalp. It looks like I’ve been burnt badly and it so painful and sore. If I eat a larger dose of diary, by accident I have had anaphylaxis. This happened when I ate scrambled eggs a few years ago without considering that these, in a pub, may well be made with lots of butter, milk and cream – a deadly concoction for me which resulted in a visit to A&E and very painful few weeks recovering from the skin rashes that resulted. I hate the term sufferer… I don’t know why. I guess I don’t want special treatment. I don’t suffer my allergies, at least not most of the time when I can avoid them successfully. I make mistakes sometimes but generally I don’t suffer. I prefer person with allergies or allergic person. Something like that. But I find that once I’ve explained my allergies, what happens to me and that even a tiny trace will make me very ill, generally most people have a lot of empathy and understanding. I think if you live with someone you see it close up, you see how much they really suffer, whereas I don’t want any fuss so you won’t actually know what my skin looks like or how many days I have not even got out of bed because I’ve been in so much pain. Most people don’t see that raw pain so they might find it hard to understand and may even think the person is just being fussy. We’re not! And even a food intolerance can be painful and affect people’s lives. It’s serious stuff so it should be taken seriously. And as for cooking for someone with allergies – it’s hard work if you’re used to using milk and tomato (two of my allergies) but if you speak to the person, understand fully what they cannot eat and also discuss what you plan to cook. It’s best to go through it in minute detail which might seem like a pain at the time, but then you will learn exactly whether your planned recipe is OK for them. Any random ingredient chucked in at the last-minute of cross contamination must be thought of too. E.g. don’t stir with a spoon from a pan that contains the allergens. Keep surfaces clean. Use a clean grill. Be careful when plating up. It’s simple stuff but it needs careful thought. What about eating out – I have had a friend have a reaction to peanuts at an Indian restaurant, even though the dish he chose should have had almonds in it – he stopped straight away because he ‘knew’ even amongst the spices. How scary is it eating out? It’s very scary eating out. I’ve had similar experiences to your friend and usually, if I can detect the peanut early on and stop eating I won’t have a serious anaphylactic reaction but it depends very much on how much peanut was consumed. I’ve been so ill in restaurants before, puking in the loos and having to leave. It’s horrible. I now rarely eat out unless we’ve planned it very carefully. I use diet cards which explain in detail what I’m allergic to 0- there are quite a few things including peanuts and nuts, all dairy, soya, celery, tomato, kidney beans and broad beans. Weird huh? I prefer eating in and meeting friends to do things that don’t involve food. I never ever quite relax. I’m always keenly aware of what I’m eating if I’m out. And the main problem is, when you’re drinking alcohol you may ignore the itchy lips or tingling sensation when you shouldn’t. My allergies are also exercise induced – so if I sit still and stay calm I might have a lesser reaction. If I walk or run or do any brisk exercise the wrong food can put me into an anaphylactic shock. What sort of questions should I ask my friends coming to dinner – without embarrassing either them or me? Basically there is no stupid question. If you want to ask it, ask. I try to go through everything, every ingredient. Read labels on packets and if you’re not sure whether to use that stock cube or whether pine nuts are OK, check. Check. And ask about anything you might not be sure about. Better to come clean that you remember you used a knob of butter than to keep quiet because you know you should have checked. If you are open and honest people won’t mind. I don’t even mind taking my own food if someone is genuinely really scared of catering for me. But once you’re eating try not to make the whole dinner conversation about allergies. That really does get so boring. But every meal out involves some kind of, “How do you cope?” kind of conversation which I HATE! I have to cope, I have no choice but I would also like to be just like you. Just normal. I know I am far from normal – ha ha. But at least I can try! I know many parents go into a complete panic when a child of theirs is diagnosed as an allergy sufferer – what advice do you give them? It is very hard. My mum has sat by my bed all night after a nut allergic reaction when I was a teenager. I don’t have kids of my own but I know lots of parents with kids and that moment when they start to take control of their own life and take responsibility for themselves and their safety must be terrifying. If they have learnt that it’s OK and totally the right thing to always check, phone restaurants before, speak to the chef and check again when they arrive they should be fine. You have to learn to let go which must be very difficult. A good friend has just gone through this very same thing, she sat by the phone all night hoping it wouldn’t ring and just about managed to ignore the urge to stake out the restaurant in a disguise so she keep an eye on her boy so she knew he was safe. He was fine and really enjoyed going out for a meal with his mates and not his parents. It’s the teenage years when people are most at risk. Alcohol may be involved which speeds a reaction and there may be that tendency to think they will be OK. Maybe they are not so allergic… how bad can it be? The Anaphylaxis Campaign run groups for teenagers which help them to cope with having allergies and learn coping techniques like eating before or taking a snack and avoiding dangerous situations. Indian and ethnic restaurants are a no-no. Encourage them to also explain their allergies to their mates – if they have good supportive friends they will look out for them too. I know mine do! The prevalence and types of reaction seem to be increasing exponentially – do you agree, and if so, why is it happening, in your view? Allergies do seem to be on the rise. I really don’t know why. There are lots of studies going on about this even as we speak. I think there are lots of possible reasons. The hygiene hypothesis where our lives are sanitized to such a degree that our immune systems have nothing to work on so start to attack itself; the harmless peanut becomes an invader it must fight to the death. Chemicals, additives and man-made things which find their way into our skin care, shampoos and food. Pollutants in the environment. Improved health, immunisations etc. all mean we live longer and have better health but at what costs? Could this affect some people and be causing the rise in allergies ie. They haven’t had to fight off measles, mumps etc. so the immune system is not used? Also, maybe allergies have always been around but not diagnosed? If you look back through my family tree many people died of asthma. I know that my allergies cause asthma as well as other symptoms. Were these people really just allergic but never able to work out what caused their asthma? Those who are born with eczema, like I was, are also at a much higher risk of developing allergies before even eating the food – this happens by sensitisation through the broken eczema skin. Doctors are learning that this is happening and parents with children who have eczema should be given better support and advice on treating eczema and how to minimise this effect. For instance – the bath emollient I was prescribed as a child contained peanuts – could bathing in this stuff have caused my peanut allergy? It doesn’t explain why even now I am developing new allergies. It’s a bit of a mystery but it’s definitely something to do with our western way of living, fast food, processed food, chemicals, pollutants. It’s not good. Some people are just way more sensitive than others. Thank you Ruth – chastening, enlightening and fascinating! 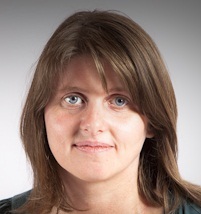 Ruth works as a freelance copywriter and marketing communications specialist www.ruthholroyd.com. She regularly blogs for various companies including the TalkHealth Partnership, ebuzzing and numerous freefrom food companies. Her own blog, www.whatallergy.com was voted in the top 5 UK allergy blogs and reaches nearly 80k visitors a month who regularly comment and join in discussions. She also enjoys writing poetry and short stories in her spare time.